EggThemes Go Market refers to special theme for marketplace, supermarket online. Whenever you customers are, they can experience your super rich, and impressive product range. An extremely neat and clean layout avoids unexpected distraction as well as messy look. Wow, what you see on the left side of the home page is vertical mega menu which is much more comfortable to follow, watch and keep track within the website. Beautiful visual effect of revolution slideshow, and promotion static block will space up your website to promote hottest deal. Tab effect shows others product in categories, yet keep it really well-organized. Product modules, and extra footer make it more informative and also easier to know your greatest offers. You are looking at one of the most stunning Prestashop designs for fashion shops - Responsive Star Market. 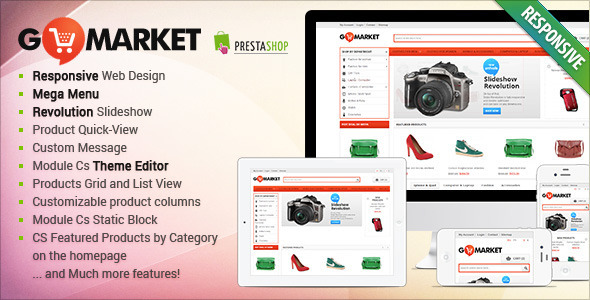 Presthemes Star Market has a well organized layout, a customizable background and powerful features. At the first look, visitors' attention will be catched right away by impressive Revolution slideshow and gorgeous featured products. Vertical mega menu is placed in the most convenient space on the left. Followed up by advertising blocks from top to bottom of the page, which keeps customer targeted. Although default theme is already beautiful, Theme Editor is still available for creative users to easily make the template in their own style or fit the business concept. Blog Module allows news and announcements shared in videos.